"I'm sorry. I'm sorry," he added. "It was so stupid, I had to say it. As a bald man, there's not a word of truth to any of that." Actor/creator/executive producer Larry David speaks in the "Curb Your Enthusiasm" panel during the HBO Television Critics Association Summer Press Tour at the Beverly Hilton on Wednesday, July 26, 2017, in Beverly Hills, Calif.
Actor Larry David has a message for a study that reportedly states bald men are perceived to be more attractive to ladies: "what a crock of s---." 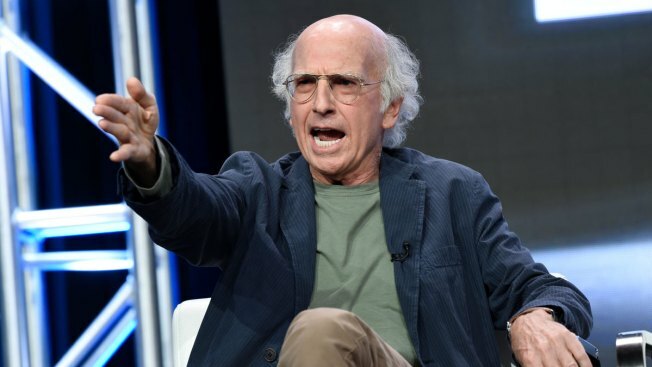 David, creator and star of HBO's "Curb Your Enthusiasm," was on the "Today" show Wednesday to promote a new season of "Curb" when host Matt Lauer steered their conversation to baldness, a running gag in the show. "I always like to talk to you about things in the news," Lauer said. He then cited a study from the University of Pennsylvania that concludes, "bald men are perceived by ladies to be more attractive, confident and dominant as compared to their full-haired counterparts." David, who is bald, responded: "What a crock of s---." David's language caused an uproar on the set of "Today," prompting yells from people off camera and causing Lauer to stand up from his chair while laughing. Lauer said the expletive would be censored for Central and Pacific time zones. "Curb Your Enthusiasm" returns to HBO on Oct. 1.